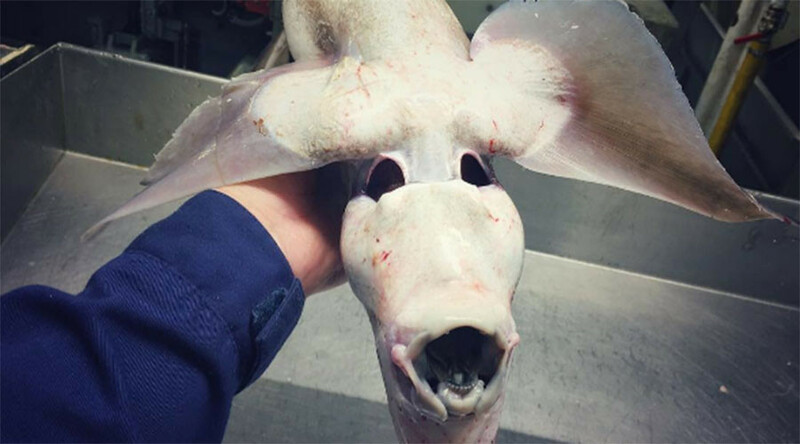 A Russian fisherman who went viral for his amazing pictures of freakish fish has returned with more incredible photos of monsters from the depths of the ocean. The photographer, Roman Fedortsov who works on a trawler in the Barents Sea, has built a huge following on Twitter and Instagram with his startling photographs of the unusual creatures that he catches in the deep. The fish, and other strange creatures come in all manner of horrifying shapes and sizes. Some have several rows of razor sharp teeth and enormous eyes while others appear to have no eyes at all. Most of the fish come from the waters of the Barents sea, however, some were fished as far away as Morocco. Fedortsov is from Murmansk Oblast in the extreme northwest of Russia. The Murmansk region is home to the Russian nuclear fleet and boasts the only ice-free port in the arctic. He compares some of the fish he’s pulled out to the terrifying White Walkers from HBO’s Game of Thrones TV series. Several fake accounts, which are impersonating the fisherman by reposting his photos, are also gaining popularity, with one already building 19,000 followers on Instagram. The fisherman does not even know the names of some of the more unusual fish that find their way into his net. The photos have sparked huge reaction online with many commenting on the outlandish appearance of the fish. “Straight out of alien,” one person tweeted while another said that the pictures would haunt her dreams.